The thing we love the most about salads besides the fact they are super healthy, is that we can make innumerable combinations according to seasons, tastes and also the ingredients we have at hand. 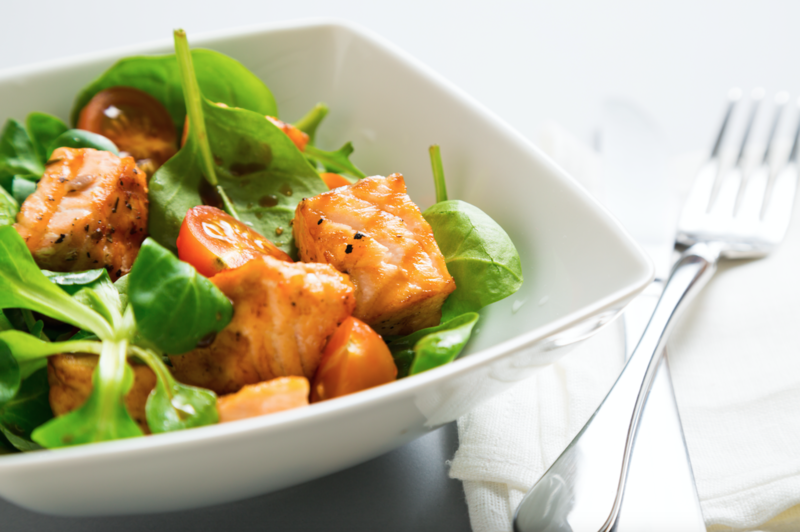 A salmon salad gives you the energy you need to continue your day without feeling heavy or sleepy after your meal. Check out our Iced Tea Beverage recipe to accompany your delicious salad and Bon Appetit! 􏰀 1 teaspoon Lil 'SHUGA! Season the salmon with salt and pepper adding the mustard mixture, Lil SHUGA!, orange juice, soy sauce and grated ginger. Make a sofrito with a clove of garlic and green oil to marinate the spinach. The spinach is served down, then the salmon crumbled, with a touch of orange zest (optional tangerine and tomato wedges are added).